Nicki was a teacher back in 2015 when she was diagnosed with cancer. She became unable to work due to the illness and was on brink of losing her home until she received a grant from Turn2us. Nicki said: “I was diagnosed with cancer and ended up having to have major surgery. “I had no income and no savings because I had not long left my ex-husband with literally just the shirt on my back. The grant gave Nicki the breathing space she needed. Unfortunately, while she was recovering, her father, a brilliant cyclist, was diagnosed with terminal cancer and passed away soon after. However, Nicki decided to honour the memory of her father whilst also helping people who may find themselves in a similar situation to the one she had experienced over the last few years. 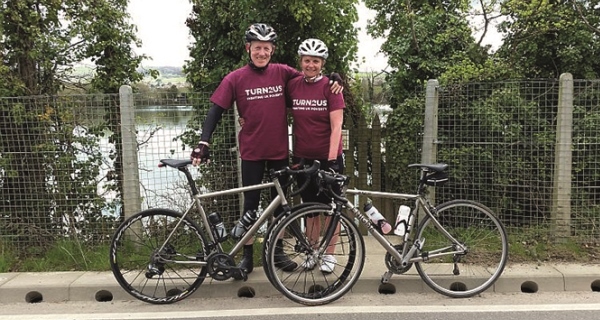 So Nicki planned a fundraiser to tackle a time trial her father did in 1961 – cycle 250 miles in less than 24 hours. The training was gruelling but, with the help of her partner, she was ready to take on this mammoth challenge. Nicki started the trial from the very same cycling club where her father achieved the same feat over half a century before. Friends and family lined up on the route with food and to cheer her on. “By that stage, it was sort of the last 20 miles of the ride. When I got to the top of the big hill, I just burst into floods of tears because at that moment I knew we were going to do it within the time limit. “I still get emotional when I think about it. I knew my dad would have been really proud of me. Nikki completed her time trial in 23 hours and 50 minutes and raised over £1,500 for Turn2us. Nikki now runs her own vegan cooking school and vegan catering business and is getting married in four weeks’ time. Without the help of Turn2us fundraisers like Nikki, we would be unable to help people out of their tough circumstances so they can continue with their bright and happy futures.